Around 10,000 years ago, the Archaic Period began with the large herd animals extinct, the climate warming and the human population growing rapidly. This period is also known as the time of the "hunters and gatherers." People were now living in small semi-permanent villages and gathered local nuts, roots and berries for their diet. With changes in climate, fauna, food sources, the Archaic people began to develop tools to adapt to their changing environment. Atlatl Handle from the Archaic Period. The Atl-atl, or spear thrower, was a technological breakthrough as important to ancient man as the invention of the gun to our more recent ancestors. The long shaft that is propelled from the atlatl handle is called the dart. River cane was frequently used in making these darts and they often attained a length of 6 or 7 feet. 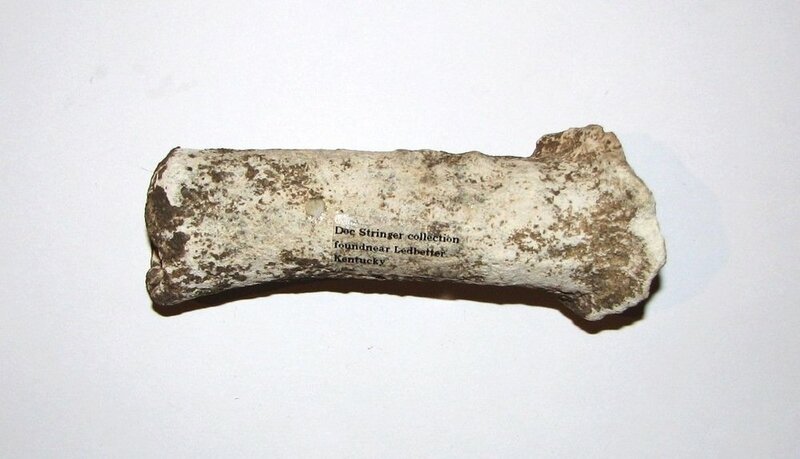 The flint points are attached to a smaller hard wood or bone shaft called a foreshaft, which in turn, is inserted into a hollow socket on the river cane dart. These foreshafts were not permanently attached and would detach from the main atlatl spear shaft to stay in the animal or target they struck. The atlatl dart could then be picked up and another foreshaft quickly inserted for another shot. By using a two-piece spear, the Native Americans could carry many of the small foreshafts while hunting and only need to carry one of the long dart shafts. This gave the convenience of multiple shots in an easy to carry package. The atlatl was in essence a "repeating spear" and is a classic example of early mans ingenuity. While hunting for meat was a main source of protein and nourishment, other foodstuffs were also necessary for a healthy diet. Much of the food, like nuts and berries, was gathered in the wild, while other types of food were gained through the cultivation of crops. Native American's would use a number of different items to aid in the processing of food. Pestle, ca. 5500 BC - 1000 BC. Hammerstone, ca. 5500 BC - 1000 BC. Not all artifacts and tools that the Native Americans used were made out of flint and created by knapping. Some tools, ornaments and other necessities were fashioned in other ways. One such method is called pecking and grinding. To create with pecking, a grinding method, a round rock, called a hammerstone, was held in one hand and used to strike the surface of the rock being shaped into the tool. Each time the hammerstone struck the rock, it would remove small portions of it. This process, called pecking, would shape the tool into its desired form. Once the tool was close to the desired shape, it was then ground or sanded with the use of sandstone until it was completed. A cutting edge was then ground or sanded along the bit edge. Wood was just as important to early man as it is to us today. Methods of acquiring and working wood haven't changed much over the years. Axes, celts, gouges, chisels and tools of many different configurations were used to chop down and shape wood. Hematite Axe, found in Texarkana, AR. Bannerstones, sometimes called atlatl weights, were mounted on spear-throwers for balance. They may also have been indicators of rank, or status, or served a cerimonial purpose. 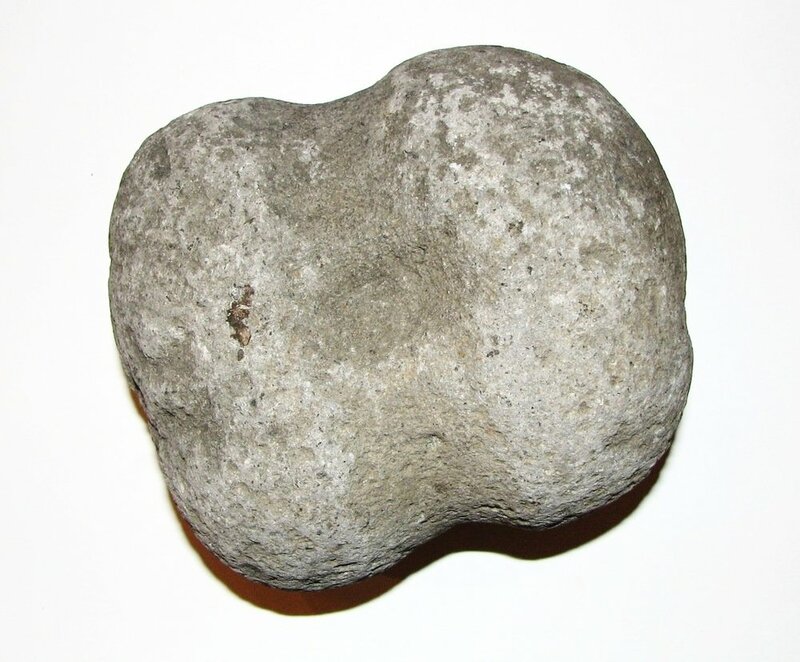 Banenrstones are unique items that come in many different forms, such as wing, saddleback and pick. Bannerstones can be found over most of North America, but are far more common east of the Mississippi River. Like axes and other hardstone items, they are fashioned by using the peck and grinding technique. 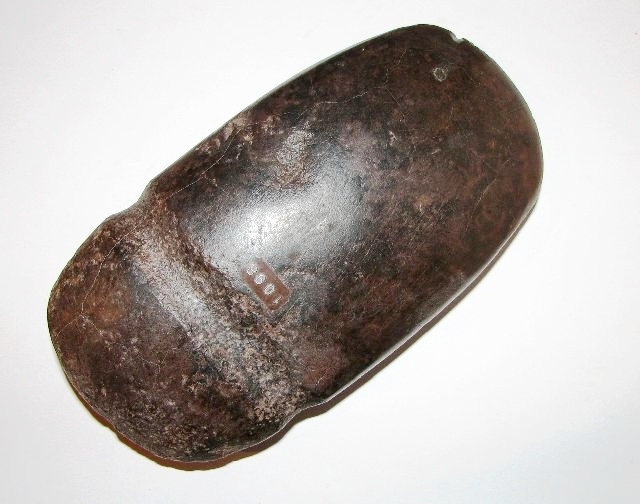 Bannerstones have been found associated with atlatls at a place called Indian Knoll in Kentucky. While it is known that some of bannerstones were used as atlatl components, different styles of could have served different functions. They are often made of very colorful and high-grade material.